Filed to: What Hath Communism Wrought?Filed to: What Hath Communism Wrought? I was both blessed and cursed yesterday, as my co-workers thought it would be hilarious to gift me a $1500 1991 Yugo GV. 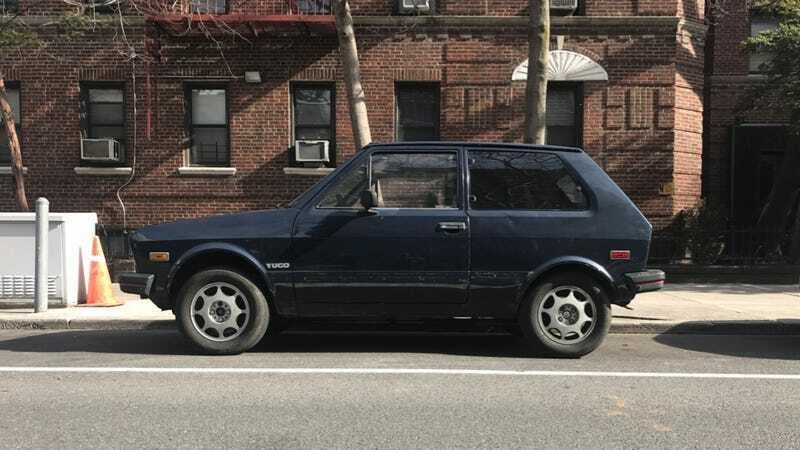 As it is a cheap as hell 26-year-old Yugo, there are some things wrong with it. Wait, no. Scratch that. There a lot of things wrong with it. Here’s everything I could find. The radio is missing which would be fine, were it not for the exposed wires left in its place. The steering wheel was not put on properly, so when it’s straight, the car is never quite straight. The headlights don’t work, but the brights do, so I need to drive everywhere at night with my brights on. The driver’s seat is the only one with a functioning seatbelt. The interior lights only light up the speedometer. The front right suspension isn’t really attached to anything, so the mounting post bounces around and makes a fun little CLONK on the underside of the hood. I’m told there was air conditioning at one point. I can’t tell if the various holes, rust, and strangely applied body parts were factory standard. This is a fully-closed driver’s side door. Is the outside of a car supposed to have exposed wiring? The fuel filler lock is gone. And the passenger window crank. The handbrake doesn’t work, so I have to use a block of wood as a chock if I park it on a hill. The block of wood is also useful for the starter motor, which didn’t work last night. It was resolved by whacking it a couple of times with the wood. Really. I’m not entirely sure what the shifter is attached to, if anything. It’s the first car I’ve ever encountered to actually have a significant amount of positive camber on the front tires. One of the rear brake lights is out. The bumpers are made out of plastic, and they all seem to be rotting. I did not know plastic could do that. The side mirrors appear to be made out of once-molten goop. There appears to have been a significant disagreement, either in the design stage or on the factory floor. Either way, the chassis and the body appear to have been for cars with two different wheelbases. But besides that, everything works! It’s mine, and it’s perfect. Does Anyone Know Of A Good Garage?